Here we are 200 episodes and six years into our story and still a long way to go. We are currently in Chapter Ten, Book #2, about midway through Wednesday afternoon. We have an action-packed evening ahead of us featuring battling dragons, flaming stilt soccer, and a visit to the Thuderdome! All this and more coming up, so stay tuned! 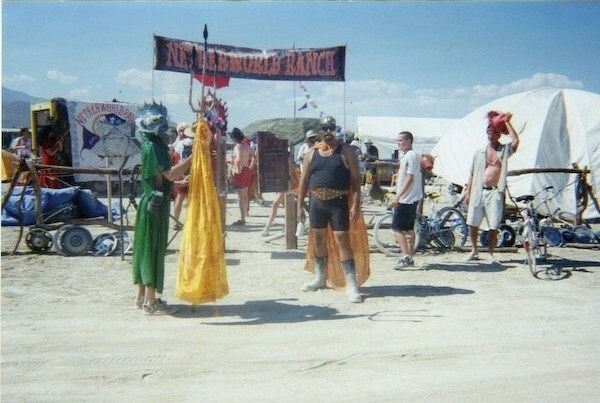 This photo was taken in Black Rock City back in 2001, and features Munkus and Neptune standing outside the Netherworld Ranch about to enter the Mud-Wrestling Tournament Supreme. Another piece of evidence from the archive proving once again that all of this is based upon true events, and I am endeavoring (to the best of my recollection) to bring you these stories as they actually transpired. Thanks again for following along with our story, and stay tuned for many more adventures in 2019!